Online vs. Face-to-Face Library Instruction - What Works? Julie Nichols and Kristin Johnson, Librarians at Northeast Lakeview College, have found that moving their library's traditional face-to-face instruction to online modules provides 24/7 point-of-need access to the materials students need to complete their assignments. In this interview Nichols and Johnson discuss the online instruction pilot program and how it will be used to assess the differences in student learning in traditional instruction sessions versus online modules. What made Northeast Lakeview College decide to implement the online library instruction pilot program? Is there a specific group of students you are testing this program with? Our college and instruction program are both growing rapidly, but our number of librarians is not! We targeted a particular group of students who are enrolled in SDEV 0370 – a student development course that is required for students who are enrolled in two or more developmental (non-college credit) courses. Students who do not score high enough on placement tests may be required to enroll in developmental Math, English, and/or Reading courses. SDEV 0370 is a semester-long course designed to help students succeed in college. The students produce a career related assignment – paper/presentation – and the focus of our instruction has been to teach students how to access and use a variety of resources to use for this assignment. Our traditional instruction for this course was a “one-shot” session of either 50 or 75 minutes. We felt that online instruction would be more effective, providing the opportunity for the student to move at their own pace and to repeat material as often as needed. Our face-to-face instruction is also hindered by the time limit and there is material that we simply don’t have time to cover, such as citation and plagiarism. We were able to include an online module on those very important topics. In addition, these students do come to the library for traditional instruction in their English and Reading developmental courses, so they are able to receive instruction using both online and face-to-face methods. What learning materials are provided to students through the online library instruction? 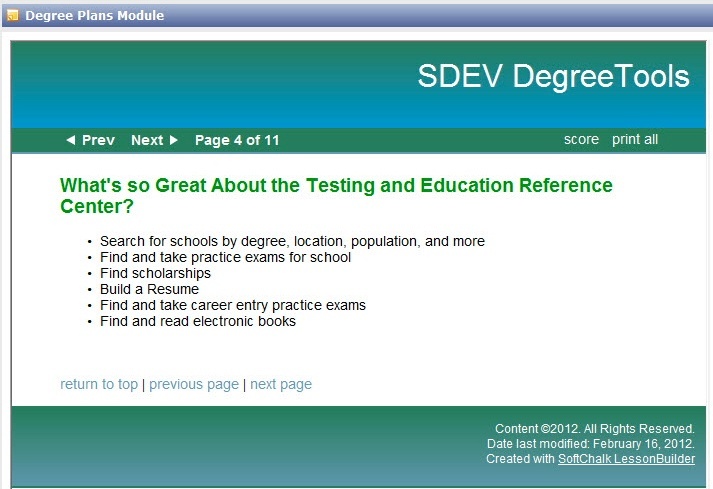 The learning materials provided through SDEV 0370 online tutorial are videos (with captions), guides, links, quizzes, and outside tutorials (from CLIP). Not all of these are in the SoftChalk modules. Some are on the LibGuide that houses the SoftChalk modules. Which features in SoftChalk have been the most useful in creating the online modules? I personally loved the activities and quizzes provided. I found them easy to create and a great way to make the modules more interactive. The quizzes could be given throughout the module or at the end. I also loved how easy it was to create modules in SoftChalk. You could pick your template, add your content, add some quizzes and activities, and then publish. It was the easiest authoring solution that I have worked with so far. Are there any benefits of the face-to-face instruction that you think the students are missing out on by using the online library instruction? First, students who come into the library for instruction have the ability to meet with a librarian, so they can put a name to a face and see us as a resource to help them be successful – we’re friendly and we answer questions! To offset that, the students using the modules have had a 20-minute “getting started” demo where a librarian goes to their classroom, introduced the modules, demonstrates how to access them, and gives students the ability to ask questions. Second, students who have face-to-face instruction benefit by actually coming INTO the library so they can see it as a place where students can gather – for study but also for some socialization. However, since these SDEV 0370 students come into the library for instruction with their other developmental courses, they do get that exposure to the NLC Library. When the pilot program is over, do you expect Northeast Lakeview College library will continue the online instruction, move back to face-to-face model or offer both options? We HOPE that all sections of SDEV 0370 move to using the online modules. We are presenting our findings to college administration on this pilot program in the second week of May and will have more information then. To learn more about the online library instruction pilot program view the recorded Innovators Webinar - Online vs. F2F Library Instruction – Assessing the Differences.